We wanted to get into the PPC campaign manager’s costume and look at the most frighteningly delightful PPC ads related to Halloween in Google. Below we present to you the top 2018 campaigns for the top 2018 Halloween keywords, organized by search volume. Using Google’s keyword planner, we did light keyword research to uncover volumes for the top Halloween keywords in Canada and the US. While the search volume peaks in key Halloween months, the volume data below is reported as an average monthly search. 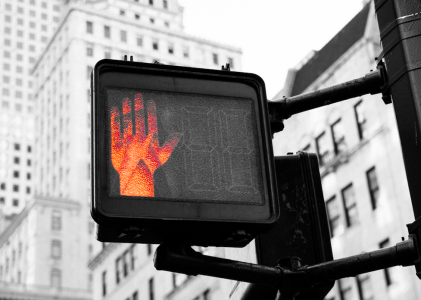 So even though Google reports the search volume of the best Halloween keywords as an average monthly metric, campaign managers making spooktacular campaigns should really only launch them in September and October. 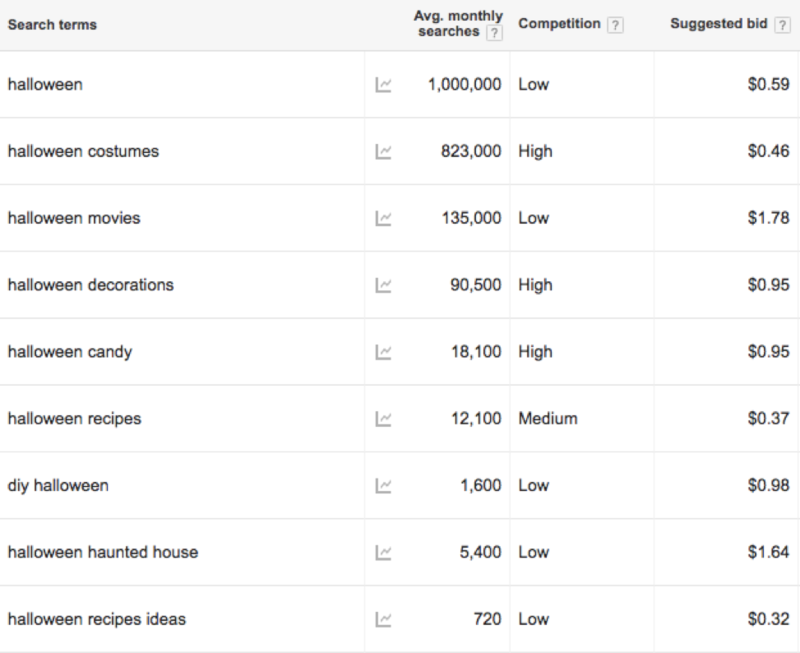 Listed in order from highest search volume to lowest, the top Halloween keywords are below. The generic “Halloween” has the top spot, followed by the usual suspects like costumes, candy, parties and more. We were surprised by the mish-mash of different companies and even religious media providers bidding on the keyword Halloween. 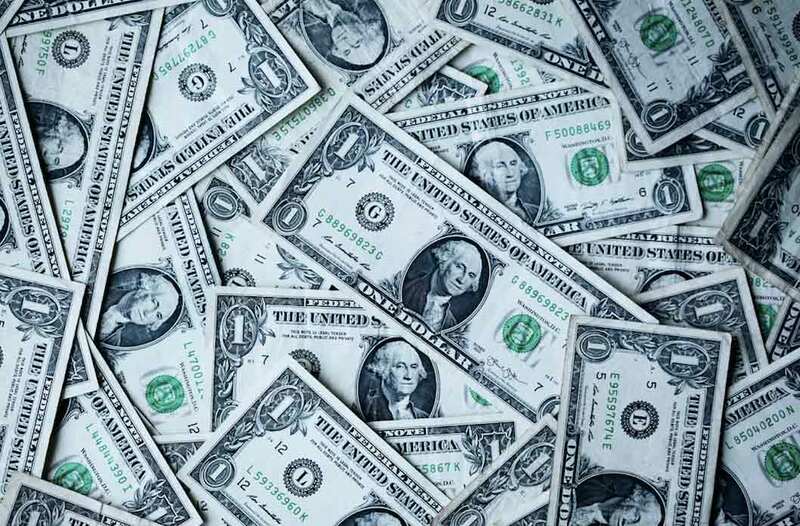 With an average monthly search volume of 1M, there were no ads on the first page. 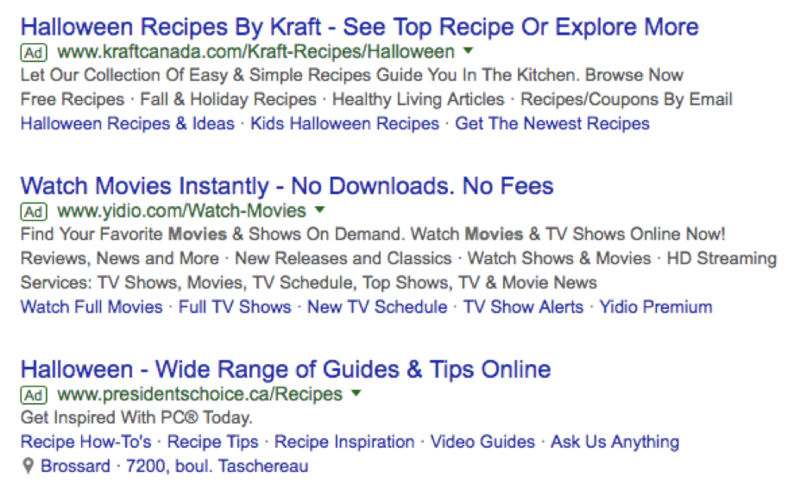 All of the ads below were found on page 2 of the SERPs. Domino’s was our favorite ad below, but special mention to Green Planet 4 Kids, for thinking of the environment this October – nothing is scarier than environmental destruction. While there was actually more search volume pertaining to Halloween costumes for women than men, as well as additional search terms with volume for couples costumes, in the interest of time we looked at the more generic Halloween Costumes search term. With 823K searches per month, this was also the only group whose advertisers made use of Google Shopping ads. The Shopping ad of a Trump costume from Showcase made us cackle and we were happy to have this visual ad in the mix. 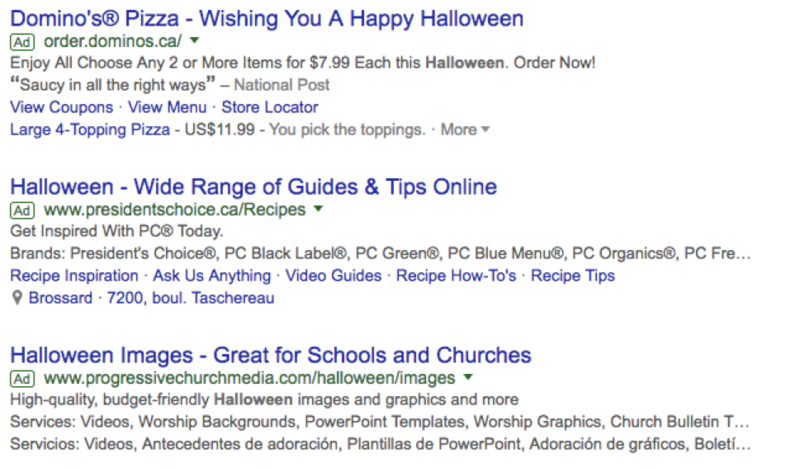 Halloween costume advertisers should be making better use of Google Shopping image real-estate. We were pleased to death to see a french ad in the mix, although this was likely geo-targeted to us being located in Montreal. All of these ads were found on the first page. The first ad by Halloween Costumes was the winner in our book of spells. On average 135K people in Canada and the US search for “Halloween Movies” every month. 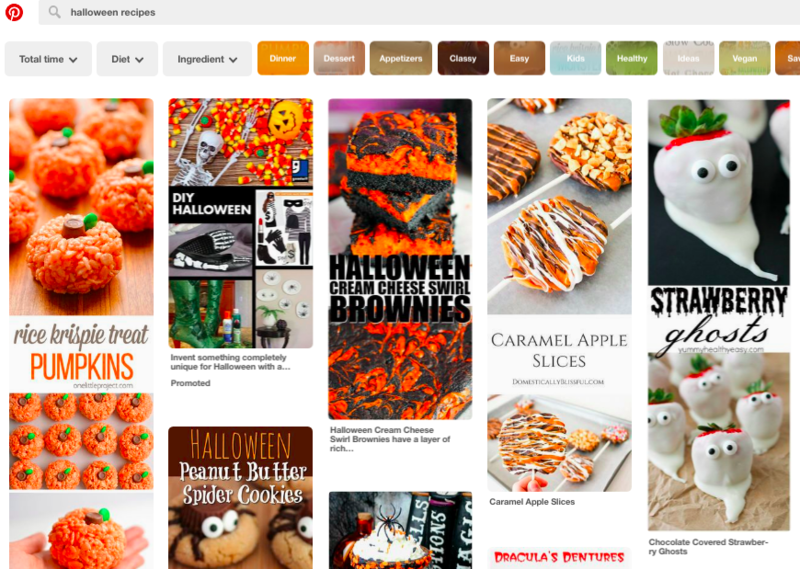 Coming in as the third most popular Halloween search term, we noticed that there were many ads not pertaining necessarily to scary movie products or services, like those made by Kraft. 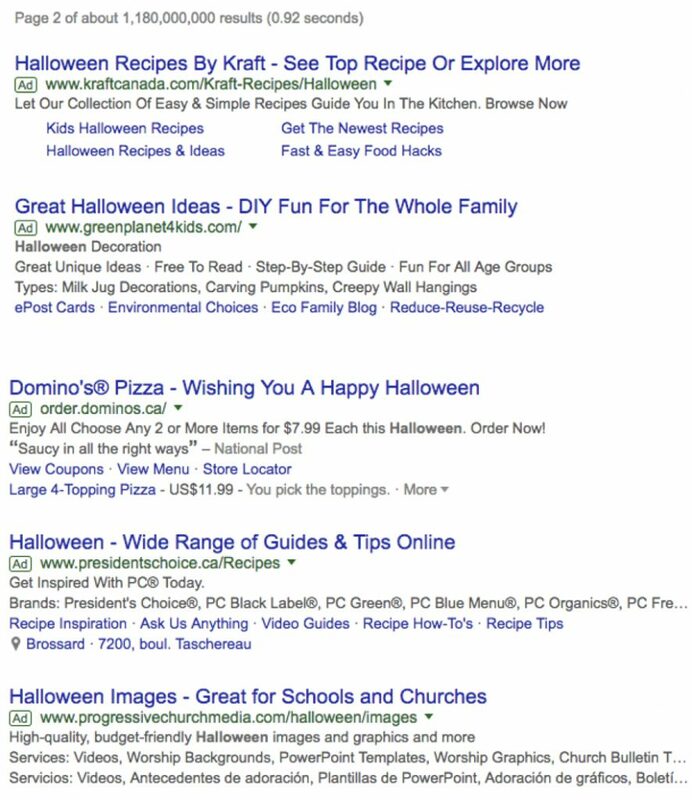 Kraft likely had “Halloween” as a phrase or broad match keyword in their campaign because their ads came up often for all Halloween-related searches. 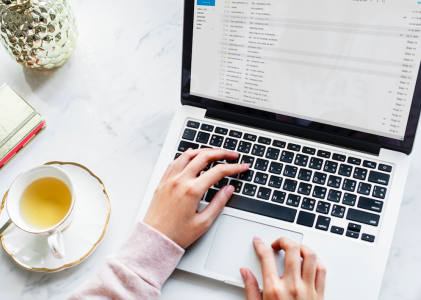 This is a killer strategy to get as much Halloween interest on your campaigns during the limited time these can run – but this only works if your campaign has money to play with. Shudder.com was our favorite ad in the lineup, but mostly just because we love the concept of horror on demand! Certainly there were less people bidding on the search term “Halloween Decorations,” than the other high volume keywords, but still we found a few. 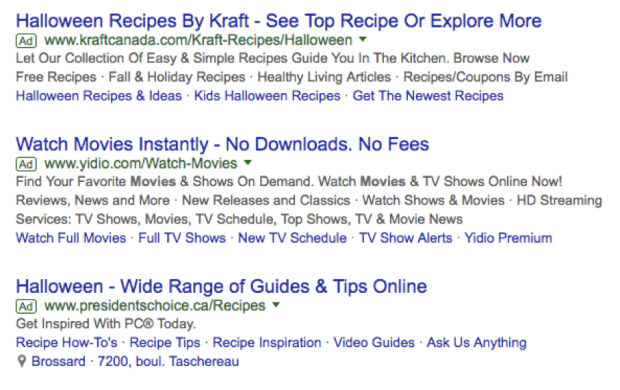 With an average monthly search volume of 90,500, there were no ads until page 2. We were most surprised about the inception of a search engine ad in a search engine ad, but still we felt Home Depot’s shopping ad next to it’s organic listing takes the candy for best ad under this search term. While kids look for candy on Halloween night in their neighbourhood, adults and parents have started to look online! This is the first year that I personally heard someone recommend buying candy on Amazon because it was cheaper than store-bought. Did you do a Halloween ad campaign this year? Tell us about it!